Soup and stews are one of my personal favorite foods. Matt is not a huge fan of them, but whenever I make one and he tries it, he gives it a thumbs up. He was particularly a huge fan of this stew. The big chunks of short rib and radishes to replace the starchy potato turn this into a keto stew paradise. Our Low Carb Beef Stew is great for any night of the week and will surely be loved by even the pickiest of eaters! Best Beef Stew - Ketofied! If I had to rate a food or recipe using only one factor on why it's the best, I would definitely go by nutritional value over taste. Maybe that's just me, but what makes this beef stew the best is the nutrition. It's low-carb, but doesn't feel so low-carb or in any way unsatisfying! 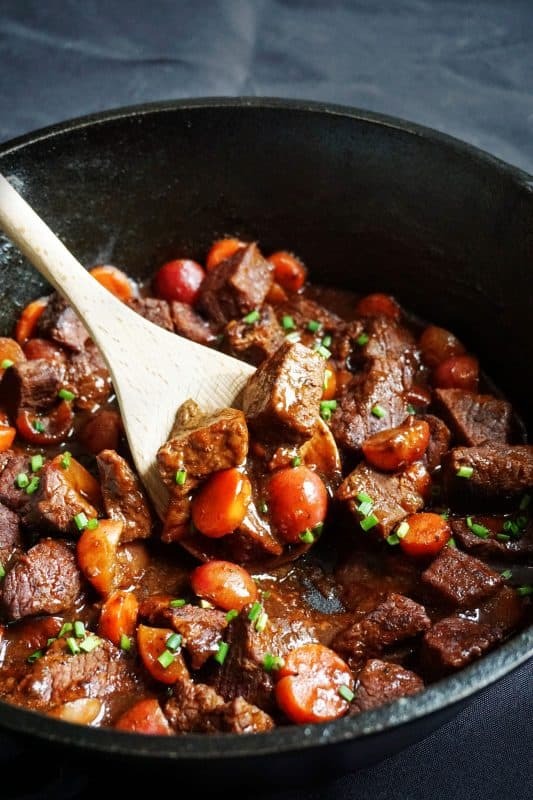 When I hear the word stew, I automatically think of hearty (and cold winter nights, but that is besides the point) so when making this stew, I really had to get in the mindset of what would make this, not only the best nutritionally, but the best on the flavor level. I had to come up with the perfect recipe that compiled the best nutrition, best flavor and wasn't over the top with ridiculous ingredients. I succeeded and I'll explain why below. I should fill you in on the fact that Matthew and I are firm believers on "if it fits your macros" so while some of you may say carrots aren't keto, we beg to differ. 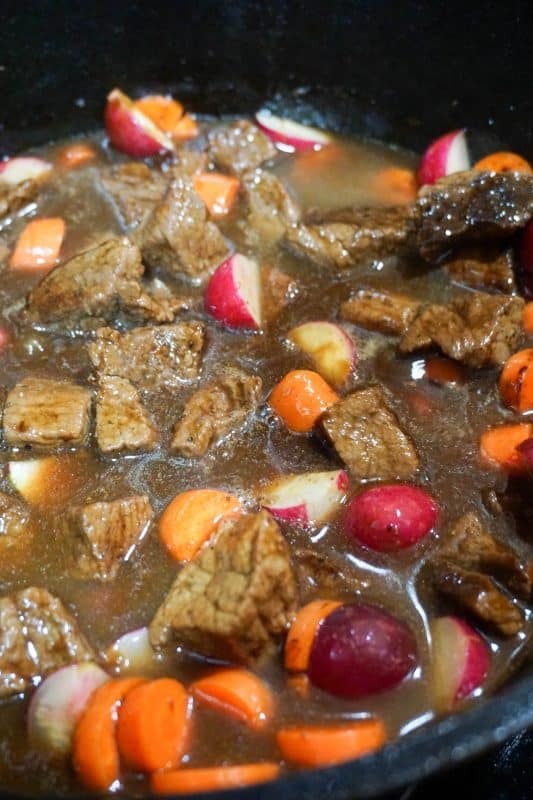 For this Low-Carb Beef stew, we used carrots and radishes, (yes radishes) as the vegetables. If you haven't cooked with radishes, you need to start now! They provided the perfect starchy to meaty to stewy ratio in this beef stew recipe. And for the "roux" component, we used our favorite go-to, xanthan gum! While some recipes are easier than others to make keto versions of, we take most pride in the ones that seem impossible at first, such as most of our desserts! For this beef stew recipe, we do have two major tips that we've kind of glossed over, but will help you greatly down the road. Invest in xanthan gum. You really only need a little, but it is by far our favorite thickening agent for all sorts of recipes, such as in our Keto Broccoli Cheese Soup. Another tip is to start using radishes in your everyday cooking. They are low in carbs and a great replacement for potatoes, such as in our Low Carb Breakfast Skillet. 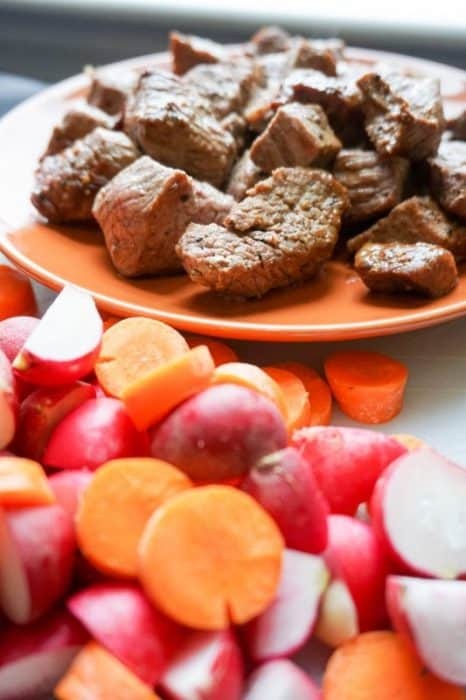 But, before you make those recipes, you need to put our tips to use in making this Low-Carb Beef Stew! 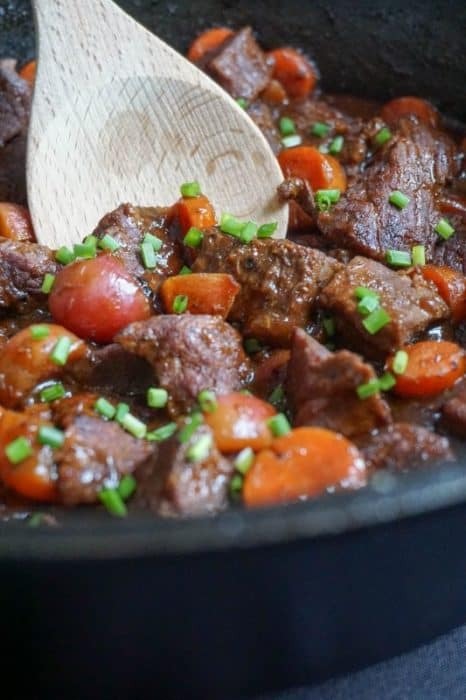 Recipe can be quickly added to MyFitnessPal - Search "KetoConnect - Low Carb Beef Stew"